The sarod is well-established as one of the prominent stringed instruments of northern Indian or Hindustani classical music. A fretless instrument similar to a western slide guitar or dobro, the sarod is able to reproduce the vocal slides and microtones important to indian classical music. 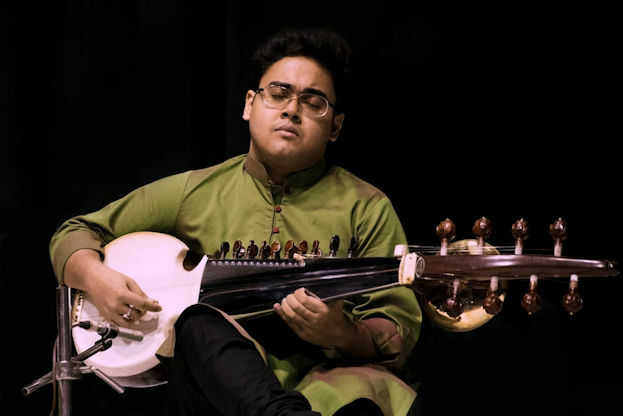 Indrayuddh has been learning sarod from his father, the world-renowned sarod Maestro Pandit Tejendra Narayan Majumdar, since he was five years old. He also received guidance from his mother Vidushi Dr. Manasi Majumder, who is a renowned Indian Classical vocalist. Initially, he had also received basic taalim from his grandfather Late Ranjan Majumder. Indrayuddh had developed a keen interest in every genre of music right from his childhood, eventually focusing on sarod as his primary choice for sheer love of the instrument and Indian Classical Music. He concentrates on maintaining the purity of Indian Classical Music coupled with his smart presentation in his concerts. 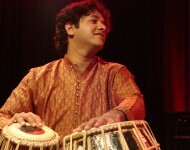 Nitin Mitta is one of the most accomplished and distinctive tabla players of his generation, with a reputation for technical virtuosity, spontaneity, clarity of tone, and sensitivity to melodic nuances. Apart from being a dynamic soloist, he is a highly sought after accompanist who has performed with some of India’s most celebrated Hindustani classical musicians, including Pandit Jasraj, Dr. Prabha Atre, Pandits Rajan and Sajan Mishra, Pandit Vishwa Mohan Bhatt, and Ustad Shahid Parvez, as well as many Carnatic musicians, such as Lalgudi G.J.R Krishnan and Lalgudi Vijayalakshmi. Nitin has also made a mark as a versatile collaborator in other spheres. He recently joined forces with 2010 Grammy Nominee Pianist Vijay Iyer and electric guitarist R. Prasanna to produce a studio album titled Tirtha that blends elements of contemporary jazz with the North and South Indian traditional ragas and compositions. Another collaboration with R. Prasanna can be heard on the soundtrack of the Oscar-winning documentary Smile Pinky. General admission: $20 (non-PCA event – PCA member discount does not apply). Online ticketing will be posted by early May. Please mark your calendar and check back at this page. 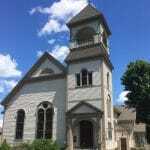 The PCA is a private, non-profit arts center located at Westford Common in a historical former church built in 1829. Now celebrating our 20th anniversary, we feature rotating art exhibits and host numerous concerts, barn dances, open mics, and theater performances. The performing space is charming, warm, and intimate with a concert capacity of 125 people.